The story of “Le Macaron Grec” has unexpectedly popped out of the Greek crisis. Through my efforts to trace back the flavors and tastes of our childhood, to combine and condense them in a tiny pastry sweet like the macaron, I fell in love with Greece again. I flashed back to our summer holidays, I remembered those boring visits to our country-side relatives with the usual fig sweets treats, I missed the remains of sesame at the bottom of our school sack, the piles of nutshells left behind to remind the famous pistachios from Aegina readily consumed, the fresh yogurt dressed with quince that was generously offered at the tavernas after the heavy meal with beef in red sauce. Greece, our Greece, is much more than beaches, sun and lying around. It is mostly what we can become of. It is most commonly stuffed with marmalade, meringue or butter cream. 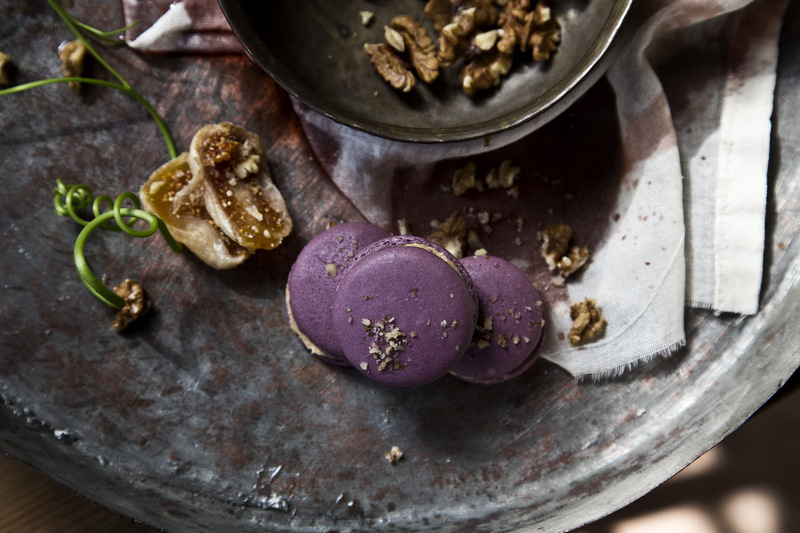 During the last two decades, though, thanks to Pierre Hermé, who brought the macaron back to surface again by introducing unexpected flavors and sophisticated combinations, such as mousseline, fruit jellies, chocolate ganache and many others, new versions emerged. In order to prepare a macaron, begin by grindind almonds together with the icing sugar. Sieve the powder twice though a thin sieve. Prepare the meringue by using the sugar and the egg-whites. Add the patisserie color. Mix everything together using a silicone spatula, until the mixture looks homogenized and smooth. All recipes that you will find here are working. The two critical points, decisive of the final product, that you must be careful of, are the mixing procedure and the baking temperature. Surf around, look, enjoy, taste, try and send us your comments and questions. We are here to listen to you and assist, if we can. It always takes two to “sweet” tango.